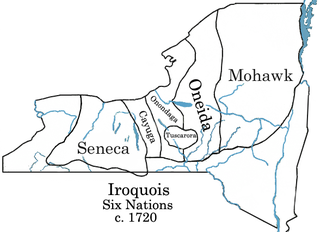 Listed from left to right: Seneca, Cayuga, Onondaga, Oneida, Mowhawk. These are the original nations, loacted in and around the Great Lakes in Canada they also settled along the border of New York. After 1720 Tuscarora became part of the five nations creating what we call now the six nations. The Haudenosaunee dealt with temperate weather ranging from frigid winters to burning hot summers, but the spring and fall promised a happy medium. The tribes were often lucky to be protected by thick dense forests commonly surrounding them from both sides. Precipitation levels ranged anywhere from 28-32 inches annually. The Iroquois peoples were surrounded by two uphill regions the Adirondacks and Appalachian mountains. 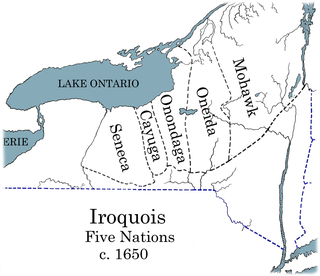 The Adirondacks occupied over 1/4 of the space the Iroquois inhabited. They were lucky to be surrounded by two rivers the Hudson and Ausible, both of these rivers ran through a few of the many plates found in southern Ontario and northern New York. Tribes were based commonly around Lake Erie, Ontario and Champlain. In an Iroquois tribe it was the men’s duty to build enough long houses that were long enough to accommodate each tribe’s clan. Each man was in charge of hunting and creating tools from earthen resource or bones of the animal, nothing was wasted. If under attack it was the male’s job to protect and defend the village from oncoming attackers. If a male was selected as chief it was his job to represent the clan at tribal councils. Women in an Iroquois village had as many jobs as the men but were to stay home and complete these petty tasks. 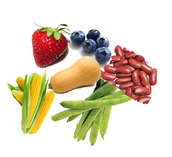 The females of the clan grew and harvested crops and preserved the food for the village. They provided the clan with meals, clothing all while caring for the children. The oldest woman in the clan was known as the clan mother, she was the wisest of the clan as she was the oldest she had authority to choose the chief of the clan and name all the children of the tribe. The Iroquois salvaged all that they could from the land that was given to them. Plants and animals were of wide variety around the great lakes the aboriginal people took advantage of this. The women gathered, corn beans, squash, blueberries, strawberries, cherries, huckle berries and nuts. While the men hunted and trapped beaver, bear deer, moose, porcupine, turkey, venison, muskrat fish and wide variety of birds in including ducks and geese. The Haudenosaunee used all parts of the animal and never wasted as resources would become scarce. Men and women of the Iroquois tribes wore similar clothes to one another. Men wore decorative feathered hats, made of 3 black ash splints, covered in deer skin and decorated in beads, feathers and porcupine quills. Males wore a fringed skirt, with a woven sash made from elm or nettles. Underneath this they either wore leather leggings, or a woven pant. The women wore dresses of deerskin, these dresses are comparable to the designs we see in dresses today; fitted then flaring at the hips. Their headwear was not as elaborate as the males but it was a simple feminine tiara, they too wore leather leggings or a woven pant under their dresses. Both males and females wore their hair long and in a single braid going down their back. 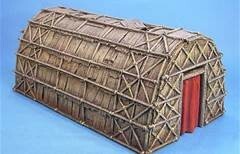 The Iroquois lived in large huts called long houses or wigwams these were huts made by covering a dome-shaped framework of poles with woven rush mats or sheets of bark. Each Long house could house over 60 people, each family with their own rooms. A room would commonly contain a raised sleeping pallet, a fire with a whole in the roof and any other personal items the family owned. Before European contact the Iroquois did not have modernized transportation systems such as the horse or cart. They did however have canoes with were commonly made from birch bark and other resources. In the winter they used snowshoes to move between huts and continue with their work. People remained members of their clan for their entire lives. Members of the same clan could not marry. When a couple was married, the husband moved into his wives longhouse, but he would never be part of her clan. He would always remain a member of his original clan. Children born to the couples were considered part of the wives clan. The Iroquois were a patriarchal society, both men and women had equal rights but men served as chiefs. Clan members worked together and shared resources but because it was a matrilineal society most possessions fell under the ownership of the women.